Connect a variety of USB peripherals to your computer with the USB 3.0 7-Port Hub with 2 Charging Ports from TP-Link. 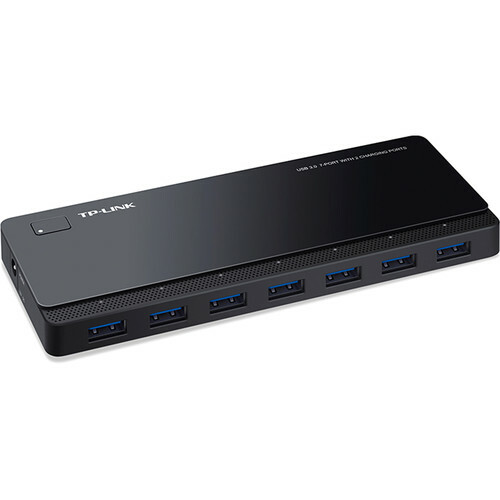 The 7 USB 3.0 ports enable you to connect devices such as external hard drives and thumb drives to your Windows, Mac, or Linux computer. Once connected, you can take advantage of data transfer rates of up to 5Gbps, ten times faster than USB 2.0, to transfer even large files quickly. Accompanying the 7 USB 3.0 ports are two dedicated 5V, 2.4A USB charging ports to keep your mobile devices such as smartphones and tablets charged. Box Dimensions (LxWxH) 7.953 x 5.906 x 2.756"
USB 3.0 7-Port Hub with 2 Charging Ports is rated 4.8 out of 5 by 8. Rated 4 out of 5 by Craig from Very flexible with one odd issue Very small footprint. Highly flexible as it can be buss only powered (sans charging port function) and AC powered. That truly makes this a rare find. Use buss only when you're on the road with laptop. Add AC when at your home base. Note that the 7 USB3 ports are in addition to the charging ports. The charging ports are not data transfer ports but that means you're not tying up any of the 7 ports while simply charging. The standard ports will charge an iPhone. I use the charging port to supply the power needed to charge my iPad. The advantage of charging ports, in addition to supply enough power for an iPad charge, is that with AC powered they continue to charge even if the computer goes to sleep or is turned off. Interesting is that this hub has a power button. On occasion, usually after the computer has been in sleep mode, I've noticed the devices aren't found. It's easy to spot as each port has an indicator light. Taping the power button fixes that. That's the only odd issue but it really doesn't present any inconvenience to me. Rated 5 out of 5 by Anonymous from Fantastic hub Very impressed with this hub. Exactly as described. 7 USB ports and 2 charging ports. I'm surprised how fast I've filled them up and am thinking about getting another one. Solid feeling, sleek and nice features. LEDs light up when you plug a device into the port. Rated 5 out of 5 by Richard D. from Great expansion of usb ports Great usb hub, it looks very good on a desk and is very sleek. I love the two charging ports for charging a phone or ipod without connecting it to sync with the computer and the set up is really easy. Rated 5 out of 5 by Richard from sleek and functional Thin, sleek attractive unit. No drivers needed. Has an on/off button and runs very cool. Charging ports do a great job. I've tried a lot of USB hubs and this one is definitely a standout. Rated 5 out of 5 by Anonymous from Best Hub for the Money Fantastic hub. Great design. I love having the 2 dedicated charging ports on the end. TPlink delivers again with a great product for cheap. Rated 4 out of 5 by HARRY S. from What They Don't Tell You What they don't tell you is that the charging ports have NO DATA. Rated 5 out of 5 by Anonymous from Adding much needed iMac ports Solid design, works as advertised. Would buy again. Rated 5 out of 5 by Patrick from Works No issues. Simple powered USB hub. Does it work when connected to USB-C port using an adapter? As long you are using an adapter from usb-c to regular usb 3.0. Is the case on this hub plastic or metal? Case is a good solid plastic material. Where is this hub made? Can this charge a tablet such as an iPad? When using one of the two charging ports it will.